Japan's railway network is extremely convenient and highly efficient JR Group railways are proud of their international reputation for frequent service, punctuality, high speed, and safety. 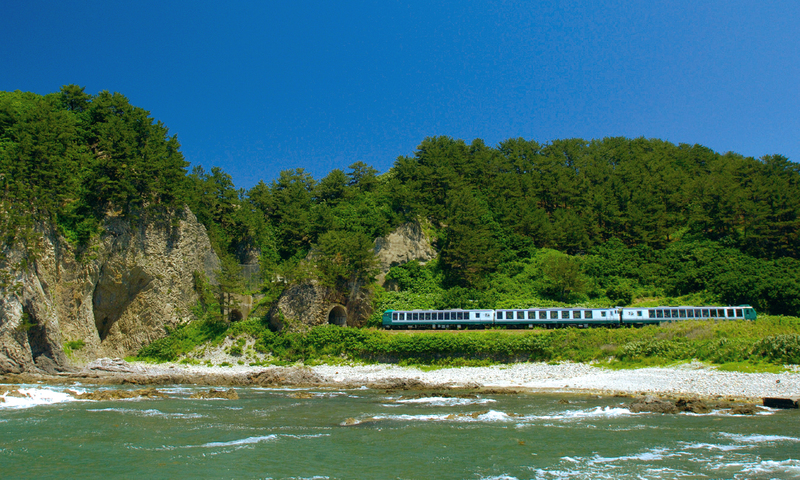 Travel by train is also the ideal way to view Japan: you ride comfortable and carefree, as vistas of a nation glide before your window-mountains, forests, lakes, highlands, and the sea. We make a £15 cover charge per booking and will then send you an exchange voucher so you are all prepared for your travels. Collecting your Japan railpass on arrival in Japan is easy, and the collection locations can be found here. Please remember, it is not possible to purchase Japan rail passes when you are there! In order to issue the pass we will require each passengers full name as it appears on their passport. The above are YEN prices for a JAPAN RAIL PASS Exchange Order; the actual cost in local currency is calculated at the time the Exchange Order is issued. Note that the purchase exchange rate may differ from the exchange rate in effect when you actually visit Japan. *Aoimori Railway (Metoki-Aomori. However, the use of local or rapid trains between Aomori-Hachinohe, Aomori-Noheji and Hachinohe-Noheji is permitted. Passengers disembarking on Aoimori Railway lines in these sections must pay separate fares. However, passengers disembarking at Aomori Station, Noheji Station, or Hachinohe Station do not need to pay separate fares. The JAPAN RAIL PASS is not valid for any seats, reserved or non-reserved, on "NOZOMI" and "MIZUHO" trains on the Tokaido, Sanyo and Kyushu Shinkansen lines. (The pass holders must take "HIKARI," "SAKURA," "KODAMA," or "TSUBAME" trains.) If you use a "NOZOMI" or "MIZUHO" train, you must pay the basic fare and the limited express charge, and for a Green Car the Green Car surcharge. In addition, if you use the GranClass car of the Tohoku Shinkansen, you must pay the limited express charge and the GranClass car surcharge. Note also that passengers using JR trains on non-JR lines must pay additional fares and charges for sections traveled on such lines. If you have an Ordinary-type JAPAN RAIL PASS and want to use a Green Car seat, you must pay the Green Car charge and the associated limited express or ordinary express charge. If you have a Green- or Ordinary-type JAPAN RAIL PASS and want to use an ordinary private compartment on a Shinkansen or a limited express train, you must pay the Shinkansen or limited express charge. If you have a Green- or Ordinary-type JAPAN RAIL PASS and want to use a Green private compartment on a limited express train, you must pay the limited express charge in addition to the Green private compartment charge. Note that if you use a Green or ordinary private compartment and there are fewer persons than the specified number for that compartment, you must pay children's fares and charges for the number of persons less than this specified number in addition to the charges described above.However 1- or 2-person occupancy of a private compartment is not available on the Sanyo Shinkansen trains. If you have a Green- or Ordinary-type JAPAN RAIL PASS and you want to use the GranClass car, you must pay the GranClass surcharge and the associated limited express charge. If you have a Green- or Ordinary-type JAPAN RAIL PASS and want to use a berth on a limited express or ordinary express sleeping car, you must pay the limited express or ordinary express charge in addition to the berth charge. Moreover if you travel on a sleeping car that passes through Morioka to Aomori, you must pay on board the basic fares for the two local sections traveled over: IGR Iwate Ginga Railway (Morioka-Metoki) and Aoimori Railway (Metoki-Aomori). If you have a Green- or Ordinary-type JAPAN RAIL PASS and want to travel on a train that requires a numbered ticket or liner ticket, a charge is payable to obtain these tickets. If you have a Green-type JAPAN RAIL PASS and choose to use a reserved or non-resreved ordinary car seat, you cannot receive a refund of the price difference between a Green Car seat and the ordinary car seat. When reserved seats are full, you should use a non-reserved seat. Also in this case, no refund can be made of the price difference between a reserved and a non-reserved seat. The JAPAN RAIL PASS is not valid for any seats, reserved or non-reserved, on "NOZOMI" and "MIZUHO" trains on the Tokaido, Sanyo and Kyushu Shinkansen lines. If you use a "NOZOMI" or "MIZUHO" train, you must pay the basic fare and the limited express charge, and for a Green Car the Green Car surcharge. You should carry your passport during travel, and be prepared to show it if requested. An Exchange Order that has not been turned in for a JAPAN RAIL PASS can be returned to the office where it was purchased for a refund, within one year of the date of issue. In such case a handling fee and communication fee will be subtracted from the refund. If you wish to receive a refund for a JAPAN RAIL PASS , this can be done at all JAPAN RAIL PASS exchange offices, providing that, in principle, the application for refund is made before the start date indicated on the pass (Ten percent of the yen price of the PASS will be charged as a handling fee.) Once use of the Pass has begun, no refund or extension of the validity period can be made in the event of train non-operation, delay, or the like. These and other usage conditions follow the Japan Railways Group passenger transportation regulations and Japanese laws. The validity of an Exchange Order, however, shall follow the stipulations and regulations of the company that issued the Exchange Order.